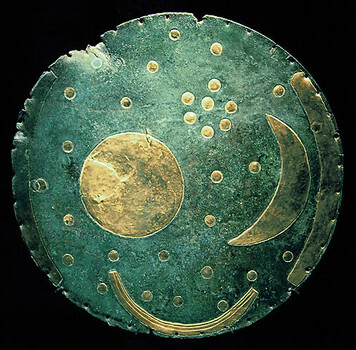 Nebra sky disk. It has been associated with the Bronze Age Unetice culture.. Dbachmann This file is licensed under the Creative Commons Attribution-Share Alike 3.0 Unported license. During the Early Bronze Age there was a very high level of territorial mobility of the Únětice culture in Silesia, a large community inhabiting the south western territories of Poland approximately 4 000 years ago. This is found in a new doctoral thesis from the University of Gothenburg which also conclusively confirms the first case of human long-distance overseas journey to Silesia from Scandinavia, probably from southern Sweden. ‘Over 3800 years ago, a young male, possibly born in Skåne, made a journey of over 900 kilometers south, to Wroclaw in Poland. He died violently in Wroclaw, killed by Úněticean farmers, possibly due to romance with two local females, who were murdered together with him. This ‘Bronze Age love story’, with no happy end today is the first case of Swedish-Polish contacts in history ever’, concludes archaeologist Dalia Pokutta, author of the thesis. The Early Bronze Age has undergone a multitude of transformations through archaeologist’s eyes over the past decades. The Únětice culture, commonly known and associated with Nebra Sky Disk, is currently considered to be part of a wider pan-European cultural phenomenon, arising gradually between III-II millennium B.C. The new study of the Únětice Culture comes as a result of international cooperation of several leading European universities within the EU Forging Identities: The Mobility of Culture in Bronze Age Europe programme. Dalia Pokutta’s work is a ‘bioarchaeological portrait’ of the Únětice culture in Poland, focusing particularly on the territories of Lower Silesia. The study presents the subject from a palaeodemographic perspective based on the results of isotopic analysis of human remains dating back to the Early Bronze Age (2200-1600 B.C). ‘It is the biggest isotopic project undertaken in Poland so far. We analysed hundreds of samples, not only human bones, but also animals. This study deals with the humans of a long-forgotten past and figuratively speaking, it has been written by the hands of fifty dead people. This story leads us to the first Europe of metals and the beginnings of the Bronze Age world, but above all to past societies and their members. The results of the analyses went beyond our wildest dreams or expectations’ says Dalia Pokutta. The author focuses on the Early Bronze Age lifestyle, medical knowledge and diseases, occupations and professions, as well as chosen subgroups of the Silesian prehistoric society, such as the tribal aristocracy, children and elders. The study provides information regarding diet and subsistence, transportation, human migrations and territorial mobility as well as the impact of these factors upon Úněticean society, expansion of metallurgy and commerce, forms of rulership and collective identity. One of the leading conclusions is a very high level of territorial mobility of the prehistoric population in Silesia, with presence of immigrants from Germany, Czechia, Hungary and Sweden. The study also confirms massive changes in European agriculture around year 2000 B.C, like the introduction of manuring on large scale. ‘My study aims at a new dimension of bioarchaeology, presenting the archaeological culture through the life histories of the people: skilled astronomers and star-gazers, talented metallurgists, farmers, explorers, merchants and barrow builders; the people who laid the foundations of the first Europe of metals and the Bronze Age world‘, says archaeologist Dalia Pokutta.